"Don't do that! It's dangerous!" Well now there's another, gentler way of teaching your kids about health and safety. 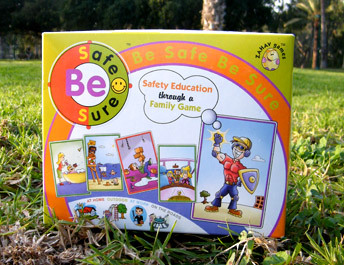 "Be Safe Be Sure", a new international safety and health promotion game. "Be Sure Be Safe develops the child's memory-related and cognitive abilities. It's also user-friendly, simple and interesting both for group work and for individual play". Promoting health and safety at school and in the home. Generating lively discussion - "How to always be safer; any time, anywhere". Presenting the safety issue in a friendly, fun and exciting way. Advocating paradigm change through safer and healthier behaviour. Demonstrating common risk situations using clear and simple illustrations. "...My family simply couldn't let go of the game! ...It looks well-designed visually too …I feel the game contributes to my daughters' idea of safety (they're 8 and 10½) and that really is its main added value." Raising their awareness of the dangers and the right precautions to take. Bringing the importance of safety to life through visual illustrations of familiar situations. Teaching them how to take responsibility for their own safety. And how easy it is. Giving them regular reminders of the inherent dangers involved in their daily lives. Helping them help you be a little stricter with the rules you may have let lapse over the years. Developing cognitive skills such as solving problems, making sensible decisions, etc. Apart from the educational.phpects of the game, "Be Safe Be Sure" will also give them hours of pleasure, intellectual stimulation and entertainment. 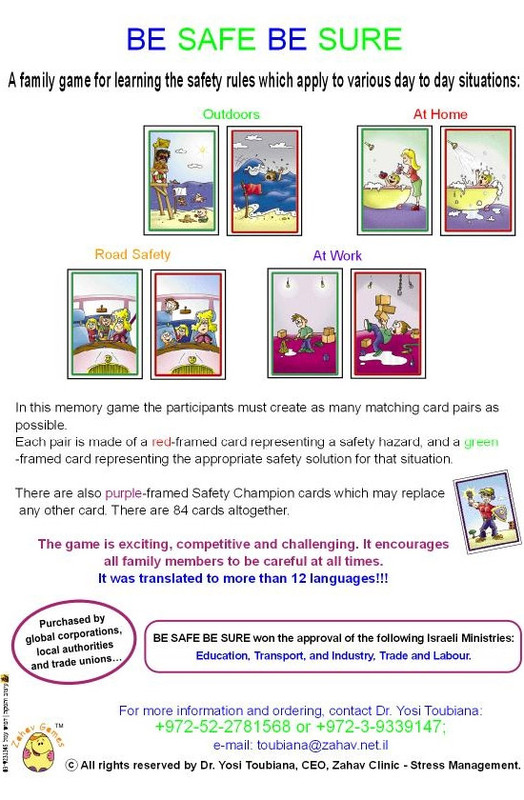 "Be Safe Be Sure" consists of 84 heavy-stock, colorfully and clearly illustrated cards, game instructions - so simple that even a 4-year-old can understand them - and a 24-page booklet containing detailed explanations of the safety hazards and how to prevent accidents. The aim is to create as many matching hazard/solution pairs as possible. The red cards portray a common safety hazard. The green cards offer the appropriate safe solution. And the purple "Safety Champion" cards serve as jokers as the kids plan their winning strategy! The game can be played by 2, 3, 4 or more participants. "We see this game as a means to promote safety awareness among children of all ages, from kindergarten age and beyond." And it's a fun and original gift to giveaway to your clients, your employees' families or as a premium for purchasing another of your related products. Now available in 12 languages! "Be Safe Be Sure" is only $15 (+ shipping) with discounts available for bulk orders. 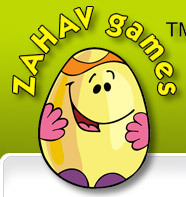 Dr. Yosi Toubiana - Senior Clinical Psychologist, toubiana@zahav.net.il.